A question for Howard please. 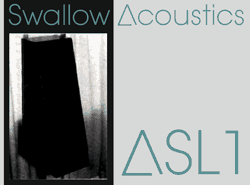 Back in the Subjective Audio days in Palmers Green you stocked speakers from Swallow Acoustics Limited. I know because I bought a pair and used them for many years. What happened to them please? Thanks and regards, Colin Thatcher. "British manufacturer of loudspeakers, incorporated in London in May 1981 by Michael Stevenson but he appears to have traded using the Swallow Acoustic name for a few years previously from Godmanchester in Huntingdon, Cambridgeshire, and in fact does seem to continue operating in that location despite the choice of incorporating in the capital. The company made at the least 4 models of speakers, a bookshelf and a tower model made in the latter half of the 70's that we have no information on and a couple of standmounters introduced around the time the operation was converted into a limited company, these are called Swallow Acoustics CM100 and the Swallow Acoustics ASL1. The former is more or less a standard if fairly tall for the time, 2way standmounter at around 0.6 meter long and is by far the most common Swallow Acoustics model you will find in the second hand market, it uses fairly unremarkable set of Dalesford drivers but still manages to sound better than many speakers from the same timeframe that use the same set of drivers such as the ones from RAM Loudspeakers, indicating a careful baffle and crossover design. More interesting are the ASL1's, they are a 2 way sloped baffle design that allows the designer to time align the tweeters to the woofer making the speaker look strangely similar to the later USA made Spica designs who used a sloped cabinet for the same reason, but even more unusually the unit features active crossovers, requiring power to the speaker and a separate power amplifier for each driver (in other words four power amps for a stereo pair). The ASl1 never sold in any great quantities being expensive at the time and the requirement for a second set of power amps not helping in that department, but the people who bought pairs seem quite taken with them, a number of them still running them as their main speakers. The company goes out of business in 1984/or early 1985 and has been de-listed by the end of that year, please note that there appears to have been another tiny one man operation in North America (probably the USA) that also operated under the Swallow Acoustics name and a few companies with a similar name such as Swallow Loudspeakers (or Swallow Audio) and Swallow Acoustic Consultants, none of which have any connection with this company. Spares & service : Most if not all SA products appear to use drivers from Dalesford, these have a tendency to show foam rot and other minor mechanical problems over time but despite the fact that replacement drivers are no longer available it should not be a problem since the Dalesford drivers used fairly standard geometries and are thus easily repairable. Be aware tough that Dalesford often supplied customers with mildly modified versions of their stock drivers especially it is common to see driver units with doped paper for more upmarket designs so make sure if you are getting a driver re-coned for the ASL1 ask the repairer to make sure that the replacement paper is identical (the drivers on that unit may be stock though), compatible doped cones are available. The tweeters are actually rebranded Audax units but much improved and fully compatible tweeters are available from that operation, not surprising since the Dalseford re-brands were not exactly the top of the line Audax models of the time."